Our mission is provide our patients with the highest quality of Optometric care through the use of the latest technological devices, patient treatment methodologies, and flexible appointment scheduling. We carry the latest designer brands of frames to provide our patients and customers with a wide selection of stylish eye wear options. We also carry a wide variety of contact lenses, and can also provide specialty contact lenses. 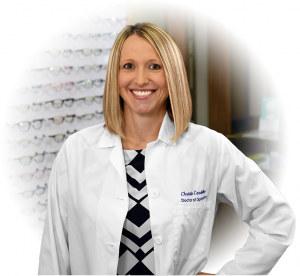 Dr. Christie Cardellino has been practicing Optometry in the Western Pennsylvania area for the past 7 years. She is a Johnstown native and a former graduate of Bishop McCort High School. Dr. Cardellino received a Bachelor of Science Degree from the University of Pittsburgh and a Doctor of Optometry Degree from Nova Southeastern University in Fort Lauderdale, FL. She is certified in ocular diagnostics and therapeutics, as well as treating glaucoma. Dr. Cardellino is a member of the American Optometric Association, the Pennsylvania Optometric Association, and the Southwestern Optometric Society. Dr. Cardellino is accepting new patients. Treatment of Glaucoma, Dry Eye, and other eye diseases.